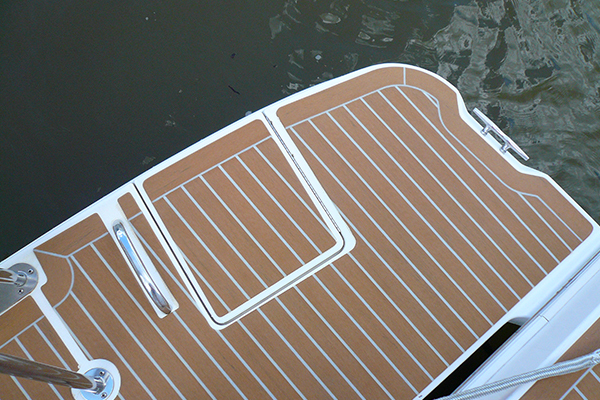 The new PlasDECK Azure Series provides the ability to see the deck after dark. Phosphorescent technology is incorporated into the caulk lines. 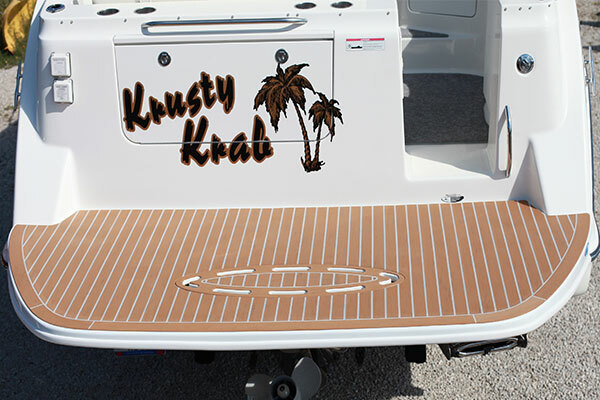 Winner of the 2010 Innovation Awards at the International Boat Builders Exhibition and Conference! AZURE IS CURRENTLY AVAILABLE IN PRE-MADE PANELS ONLY. NOT FOR DIY. 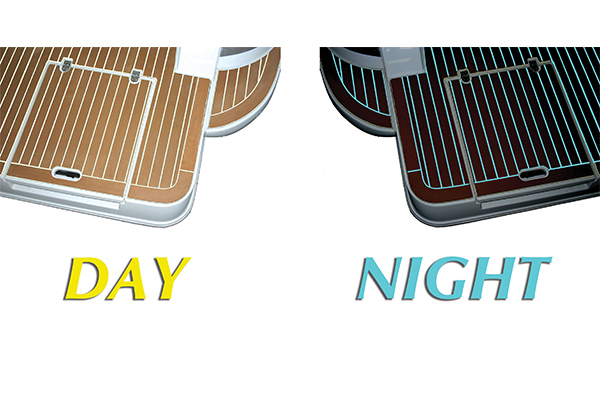 The new PlasDECK Azure Series provides the ability to see the deck after dark. New cutting-edge phosphorescent technology is incorporated into the caulk lines in the material. After it is charged by normal daylight, the lines glow a soft azure blue from dusk to dawn. This brings a new level of comfort, security, and safety after dark. This environmentally-friendly natural light doesn’t depend on batteries or wires. Wherever the decking is installed – be it platform, step, or cockpit – the boundaries of safe passage are clearly marked. PlasDECK Azure is currently available only in pre-made mats based on templates. Contact us for a quote! 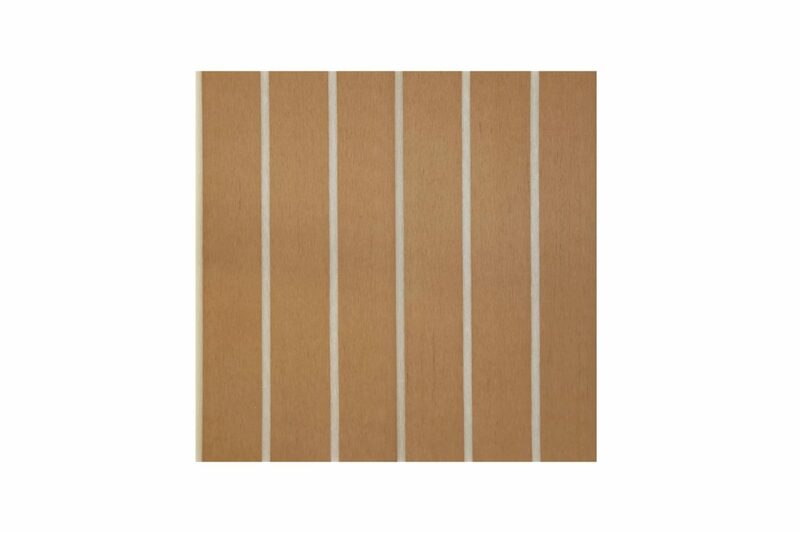 Of course PlasDECK synthetic decking is non-skid, environmentally friendly, looks great, requires virtually no maintenance, and costs much less than real teak wood. In addition to these well-known facts, we decided to raise the bar for synthetic decking. As avid boaters, we expect much more performance. PlasDECK is specially formulated to surpass any competing products. 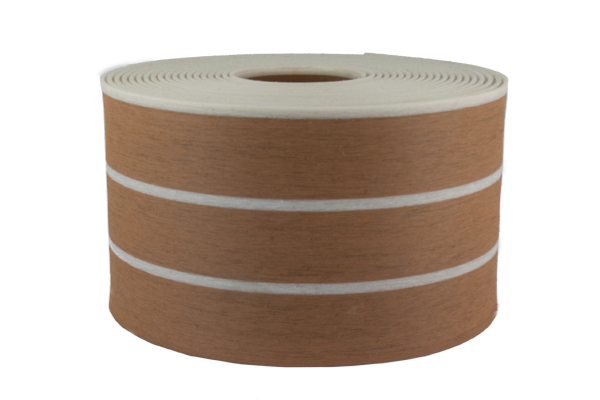 PlasDECK is the best choice for synthetic teak decking and we’re happy to prove it to you! We’re the ONLY patented synthetic teak decking that is made in the USA. 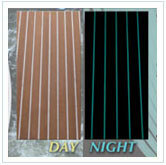 Our patents are for the chemistry of PlasDECK, which is far superior in comparison to other decking products. We use the highest grade of UV protection available, which means your PlasDECK contains the absolute best protection from the sun’s harmful rays. We use non-migrating plasticizers, which means PlasDECK won’t dry out, crack, or crumble over time. We use antifungal agents which means no nasty mold or fungus. Also, PlasDECK simply looks more like real freshly-oiled teak. We can assure you that your PlasDECK decking will retain its teak appearance for a long, long time, and that you will be enjoying your PlasDECK for years to come. Unlike our competitors, we proudly share the results of the weathering studies performed on PlasDECK to demonstrate the longevity of our material, and as always, we are available to discuss any other questions you may have. This item is only available by contacting PlasDECK. Call us at 330-668-2587 or email us.